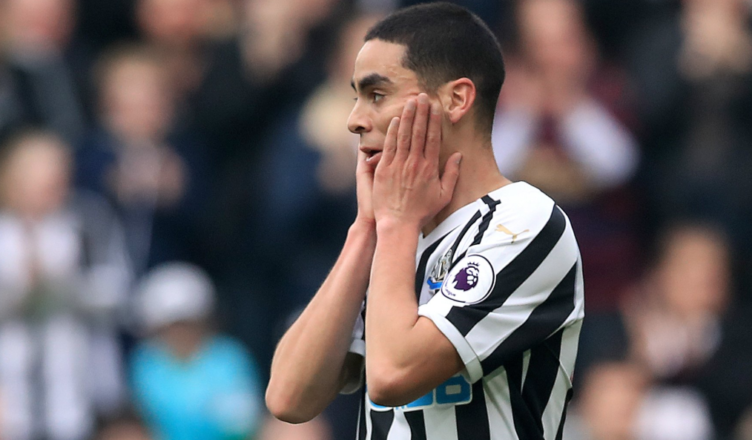 I still can’t get over what I just watched from Miguel Almiron.. – NUFC blog – Newcastle United blog – NUFC Fixtures, News and Forum. I still can’t get over what I just watched from Miguel Almiron..
Is there a single Toon fan out there who was left unimpressed by the home debut of our new record signing Miguel Almiron? I somehow doubt it. We had been told he was fast and could run with the ball, so that hardly came as a surprise, but if like me you have spent time checking him out at the Denis Wise Academy Of Internet Scouting (Youtube) and seen the standard of the MLS defences, and particularly goalkeeping, you probably weren’t expecting the tornado that turned up against Huddersfield. Sounding like a newly discovered planet in the latest Star Trek adventure, Almiron demonstrated that his touch, his vision and his presence of mind put him out there in a field of his own, but in particular I was impressed with his ability to find space, both as an individual, and with his passing. If I’m perfectly honest, I’d say he was pipped to Man Of The Match by Longstaff but that’s a conversation for another time. This is about Almiron. The transfer market these days is ridiculous with no kind of consistency when it comes to value for money. We send Mitro off to Fulham and for the same amount that we could end up getting for him, we end up with an Almiron and enough change for a couple of Schars. It’s a fact of life that different leagues have different standards, which makes the Mitro transfer even more mind-boggling, and I had more than my fair share of doubts as to how good Almiron could be. Let’s face it, half decent Prem players head off to the MLS as a last ditch effort to extend their careers. For them it’s an alternative to a trip to the Glue Factory. US journalist Ambrose Bierce wrote “War is God’s way of teaching Americans geography”. You could say the same thing about retiring Prem players and the MLS. Players just don’t go the other way. It might even be against FIFA regulations! I’ll have to check. But this one glimpse of Almiron, who is possibly still not fully match fit, in action belays any of those fears. So apart from pace, touch, vision, presence of mind and the ability to find space, what have the Romans ever…… oh sorry, wrong script, what does Almiron bring us? Forget his impressive display on the park. He brings us so much more. Bragging about the number of attempts on goal while playing against the worst team in the league, who were down to ten men after 20 minutes, could seem a bit, well, almost childish, but bearing in mind that we’ve had games this season where the number of attempts on goal could be counted on the number of fingers on one foot, I think we’ll risk the “childish” taunts for the moment. What was apparent, and I’m not willing to accept that this is just a coincidence, was how much better Perez played. More mobile, more involved, more flamboyant and generally just, well, less ****! I hate the way footballers are allowed to be bad players and we let them off because it’s obviously a “confidence” thing, but I would have to say that when Almiron’s debut coincides with the best display I can remember seeing from Perez, I’m leaning towards the “c” word, and surprisingly it’s not the one I normally call him. The stadium was on fire from the moment our new signing walked on. He has single-handedly raised the spirits of the faithful. Those same fans who just weeks ago would have thrown themselves from the rafters, had they not been in need of so much maintenance.Who was the last player to do that? Are we back to whole full-house, fortress thing of the past? Possibly. Is this new arrival going to influence season ticket sales? I think so. What else did Almiron bring us? There’s talk in the local rags this morning that Rondon is willing to commit his future to us now. Coincidence? Possibly not. Life has to be a bit more bearable when goal scoring opportunities are like buses. You miss one but you know there’s another one coming along in a few minutes.Previously Rondon had no concept of buses. He had to walk there himself. Then of course there’s Rafa. Will he stay based on a single purchase? It depends on how much that one buy affects the club. Personally while, of course I want him to stay, there’s a bit of a Free Willy voice within shouting “Run, Rafa, Run”. No manager in his right mind would stay with us, having been subject to the restrictions placed on Rafa. Surely a last minute Greg’s Pastie doesn’t make you forget the last 3 years of bread and water. I’m sure Rafa’s a smart enough guy not to have his head turned, but that’s his decision, which no doubt at all he has already made. I’m sure we’ve all made the assumption that Almiron’s debut performance is just the beginning, and he wont go all Kenedy on us. I’ll stay positive and assume there will be no more assassination attempts of the severity of Tommy Smiths effort; The new boy will not suffer from climate issues; He will find the Concept of “Geordie” to be too alien. So do we now have the foundations of a decent squad? Would you have believed a couple of months ago that Shelvey, Dummet and Atsu would have difficulty getting a game? Do we have something we can build on, or will Ashley bail out on the Rondon purchase and flip Almiron for a quick profit come the summer? The one thing you can be sure of is that something will happen. Will Miguel Almiron Be Able to Handle the Frenzy of Expectation? I would mate but I tend to keep the top banner of discussion threads to pre-match and post match, otherwise this would’ve been the new thread at lunch time just hours after the Burnley preview and also just a few hours before the post-match.